Organizations are mainly put up to serve a purpose. They may stand to be of service to the poor, provide jobs to the unemployed, lead an entire nation or just sell their products to those in need. Whatever that purpose may be, all organizations have one thing in common: they all target a specific clientele. Aside from the products or services that they offer, the one aspect that all their clients take note of is their level of customer service. Customer service, generally, is defined as “the assistance and advice provided by a company to those people who buy or use its products or services.” In a nut shell, it is making sure that clients’ concerns and issues are heard and addressed timely and appropriately to ensure positive customer comebacks, client retention and loyalty and eventually, more customers at the doorstep. In an organization setting, providing excellent customer service must be considered as of utmost importance. Excellent customer service is a key factor to all organizations’ success; because in the first place, they exist to serve their customers, anyway. This is where organizations are usually judged by their clients; and everybody is considered another person’s customer. The person may be an employee serviced by their employer or vice-versa; or a direct customer buying products or services. The service that one provides to another is a determinant of how genuine an individual is and how that individual treats and cares for that other person. The type of customer service helps people decide whether to stay with and be serviced by an organization or move on to the competition. 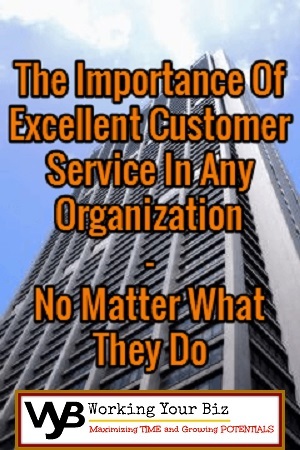 So as conclusion, the provision of excellent customer service by any organization, and everyone representing it, is, indeed, absolutely important and will say a lot about how the organization does and their upcoming success.